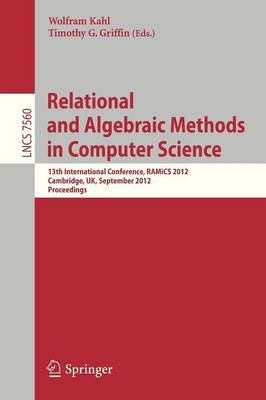 This book constitutes the thoroughly refereed post-conference proceedings of the 13th International Conference on Relational and Algebraic Methods in Computer Science, RAMiCS 13, held in Cambridge, UK, in September 2012. The 23 revised full papers presented were carefully selected from 39 submissions in the general area of relational and algebraic methods in computer science, adding special focus on formal methods for software engineering, logics of programs and links with neighboring disciplines. The papers are structured in specific fields on applications to software specification and correctness, mechanized reasoning in relational algebras, algebraic program derivation, theoretical foundations, relations and algorithms, and properties of specialized relations.